GU10 Scoop Downlight. Lamp Type: GU10 220-240V. 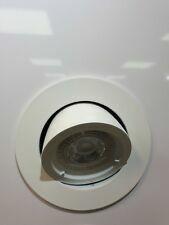 Large Recessed Downlight. Twist Lock bulb Insert and replace. Finish: Satin. Cut Out (mm) Φ 85 - 90mm. Downlight can be tilted or left flat. 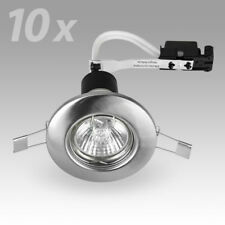 Orders are dispatched daily Mon - Fri.
GU10 Scoop Downlight. Lamp Type: GU10 220-240V. Twist Lock bulb Insert and replace. Led Compatible. Cut Out (mm) Φ 85 - 90mm. Downlight can be tilted or left flat. GU10 Scoop Downlight. Lamp Type: GU10 220-240V. Twist Lock bulb Insert and replace. Cut Out (mm) Φ 85 - 90mm. Available in White and Satin also. Downlight can be tilted or left flat. Designed for ceiling mount applications, this modern light source accepts one 60-Watt incandescent bulb, which is not included. x 6-3/8 in. 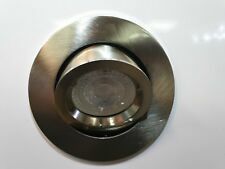 Ceiling mount applications for bathroom or hallway lighting. $Product Benefits • This 13 watt 5" and 6" downlight module is for both new and retrofit construction. • One of the Highest CRI on the market...(CRI) is a scale from 0 to 100 percent indicating how accurate a "given" light source is at rendering color when compared to a "reference" light source. With a higher CRI, the better the color rendering ability and a more realistic look. • No mounting spring conversion necessary ready to fit in either 5" and 6" LED housing cans. It installs easily in most standard five inch and six inch recessed housings, including IC and non-IC units. • The unit generates warm light with built-in LEDs that offer a natural warm light with high energy savings. Bowl-shaped Tiffany Glass Shade. The glass is Beige opalescent, the jewels are Amber and the look is to die for. Watts per bulb: 60. Designed to cast light in an upward direction. Unique pieces, no two are alike. Bulb Type: Compact Fluorescent, Incandescent. Matte Opal Glass Shade. Shade Shape: Round. Shade Material: Glass. Shade Color: White. Shade: Yes. Energy Star: No. Light Direction: Down Lighting. P/N - SL760341. The sweeping arms and rich Satin Pewter finish bring a casual elegance to any interior space. H and extending 7 in. 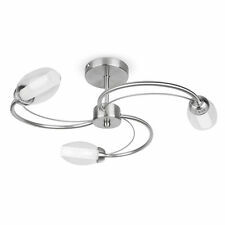 this 3-light wall sconce is best suited for a bathroom or powder room. Dimmable: Yes. Bulb Type: Compact Fluorescent, Incandescent. Decor & Organization. Depth: 6.36". Includes Glass Guard: Yes. Designed to cast a soft ambient light over a wide area. E26 is the most common bulb type and is generally interchangeable with E27 bulbs. Oil-Rubbed Bronze. - Opaque frosted glass shades. Fixture is covered by a manufacturer 5 year warranty; finish is covered by a 2 year manufacturer warranty. Accepts A, PAR30, and BR30 bulb shapes. Watts per Bulb: 100 watts. Bulb Included: No. Accessory Type: Heads. The glass is Beige opalescent, the jewels are Amber and the look is to die for. Our goal is to provide you with a huge selection and the freedom to choose from only top quality products, without overwhelming you with poor value options. The Brushed Nickel outer finish and beautiful Satin Etched Glass form a distinctive, linear design. Part of the Roswell Family/Collection. Finish: Brushed Nickel. Glass: Satin Etched. Cancelling your Order. WARNING :California Proposition 65 : This product can expose you to chemicals including Lead, which is known to the State of California to cause birth defects or other reproductive harm. The warranty does not cover loss, theft, misuse, abuse (intentional or unintentional,) unauthorized modification, improper storage conditions, lightning, natural disaster, or random acts of God. This 1 Light Mini Pendant From The Roswell(Tm) Collection Will Create A Unique Impression In Your Home. The Brushed Nickel Outer Finish And Beautiful Satin Etched Glass Form A Distinctive, Linear Design. Ajax Collection 1-Light Textured Coffee Bronze Indoor Ceiling Mount. elivering style and texture is this one-light indoor ceiling mount. Designed for ceiling mount applications, this modern light source accepts one 60-Watt incandescent bulb, which is not included.